Dessert #2 on the menu was Nutella and Rosemary Marshmallow Squares. I was inspired by an article I read in the LA Times about how a writer accidentally discovered how some basic, homey desserts such as chocolate chip cookies, brownies and shortbread could be transformed with some unexpected ingredients such as herbs and spices. 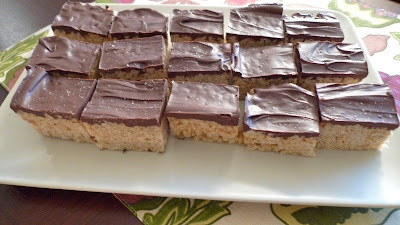 One that particularly caught my attention was Rosemary Marshmallow Squares. I use a lot of rosemary in savory meat dishes, but never in baked goods. I'm not sure why but rosemary and marshmallows, although an unlikely pair, in theory seemed like it could work. 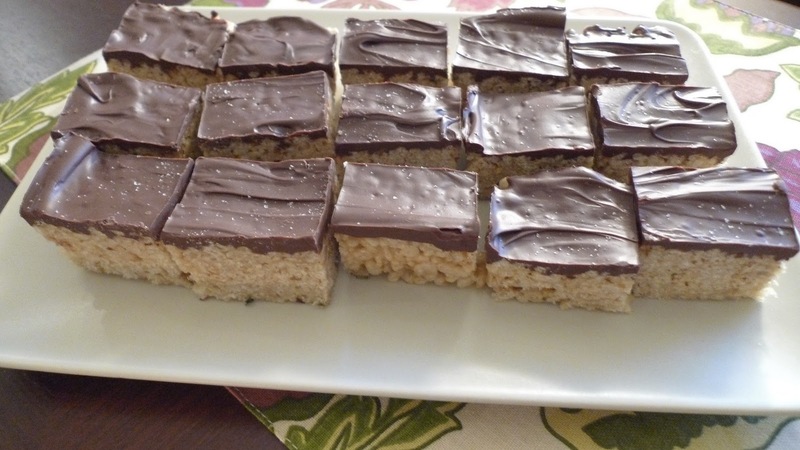 I thought serving rice crispy treats might be a little boring, so I decided to tweak a similar recipe for Peanut Butter Crispy Bars from Baked. 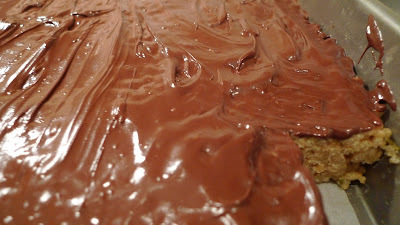 I substituted peanut butter for nutella and made one layer of chocolate on top. 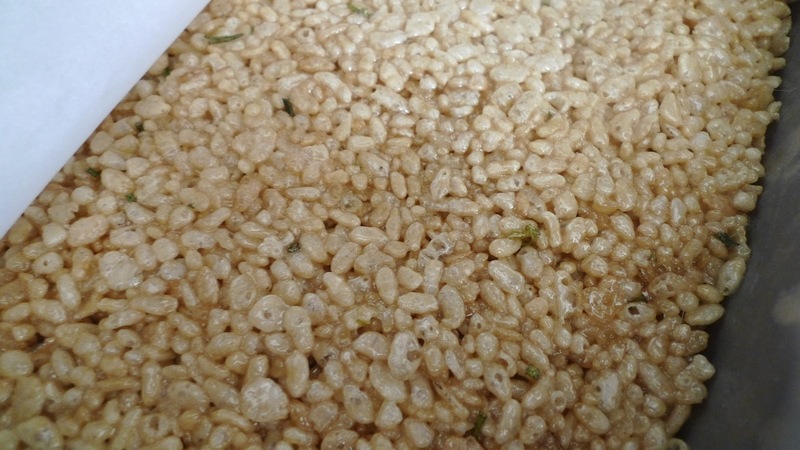 Some of my friends were taken aback by the strong rosemary flavor, but I loved it. 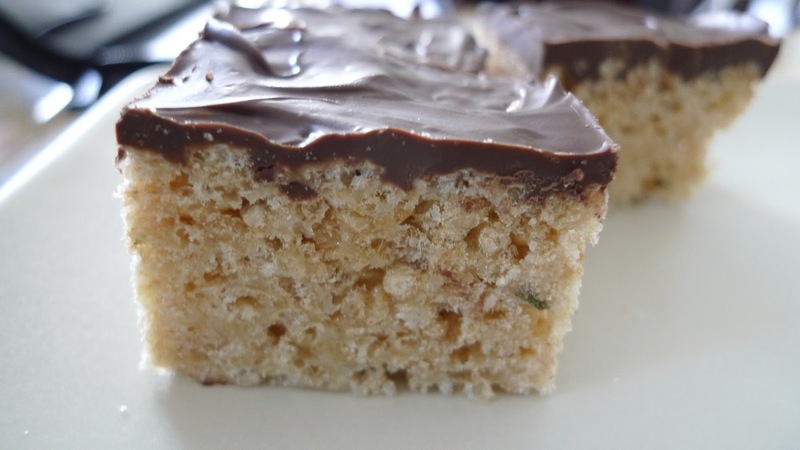 For me, I thought the piney flavor melded really well with the sweet, buttery rice crispy square and the hazelnut chocolate topping added another level of intrigue to it. In a large sauté pan heated over medium heat, melt the butter. 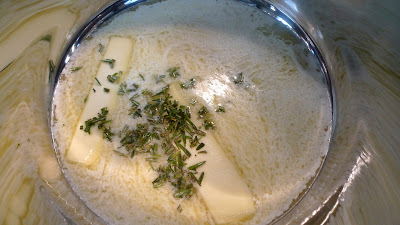 Add the rosemary and stir until the rosemary is coated. Stir in the marshmallows, and continue to stir until the marshmallows melt and mix with the butter, about 5 minutes. Stir in the vanilla and salt, then slowly stir in the cereal until it is evenly coated. Remove the pan from the heat. Transfer the mixture to a shallow 9-by-13-inch baking pan. 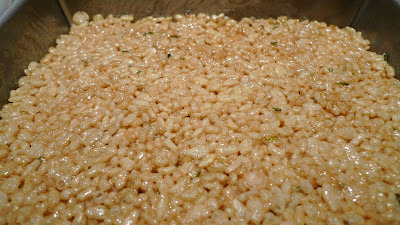 Cover the top with parchment paper, pressing down firmly to level off. Set the pan aside for at least 1 hour to cool. 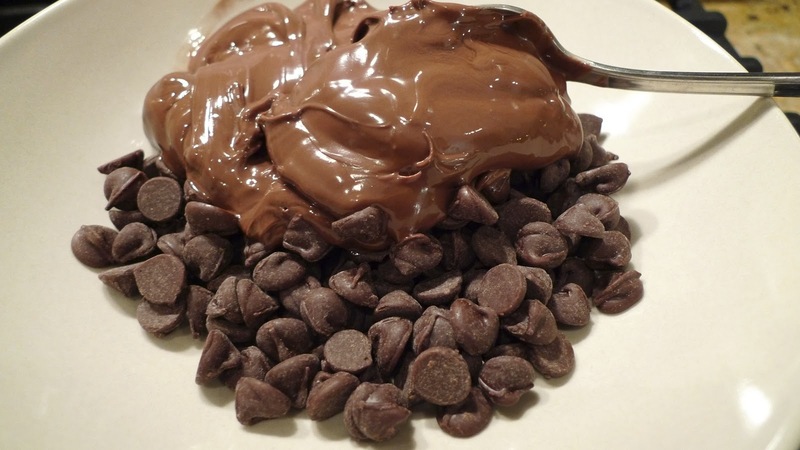 Now you can prepare the chocolate topping. 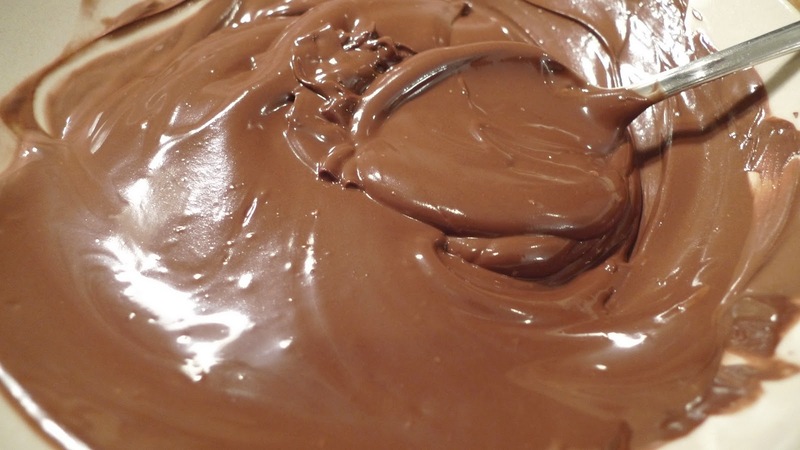 Melt the chocolate and nutella in a double broiler. Remove from the heat and stir the chocolate and nutella mixture for about 30 seconds to cool lightly. Pour the mixture over the cooled crust. Put the pan in the refrigerator for 1 hour, or until the top layer hardens. (As you can see, I couldn't wait to try my creation so I cut myself a piece). Once it's cooled, you can cut into little squares and serve. These taste really good slightly cold, in my opinion. I'm telling you nutella and rosemary is going to be the next big flavor combination - I call it! i don't have a double boiler.. next best option? 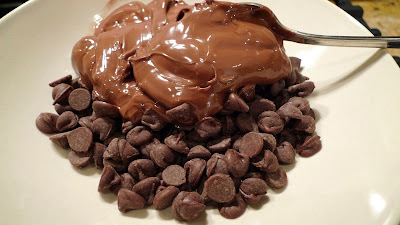 I don't have a double boiler either, so usually i put the chocolate in a glass bowl over a smaller pot of boiling water and heat the chocolate that way. Don't tell anyone, but I've also microwaved them in short increments. Just make sure to keep an eye on it. i had to coat my cake balls this weekend and I guess the stove was too hot where the steam made my chocolate a clumpy mess. added oil to try and smooth it out but that was a failure. btw, nutella on anything is divine... but you can't sell me on rosemary. you gotta try it i tell you, it's a really good combo. i'm hooked. oh yes, you have to let the water simmer, sorry i shouldn't have said boiling water. you gotta put it on low heat. so my chocolate wasn't very smooth.. i added oil hoping that would help the consistency but no avail. but i don't know if maybe my measuring cup is off.. but the crisp bars part for me was soggy. Did you put it in the fridge for an hour. That firms it up. Hmm, that's weird about the chocolate.